Romance six gorgeous girls and reshape the story around your chosen one true love - with multiple endings up for grabs. Forget static visual novel conversations: Fully animated characters move and react to one another's lines, all voiced by the original Japanese cast across more than 40 hours of audio. 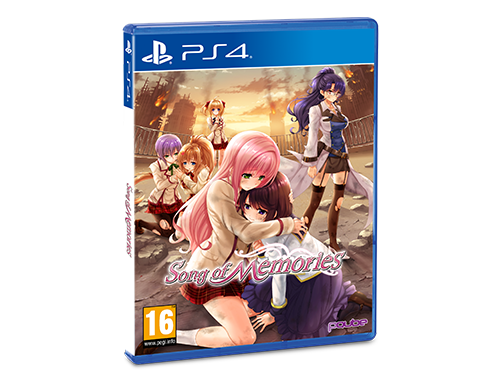 Don't be fooled by the colourful exterior: Song Of Memories is a tale of love in the early days of a monster apocalypse! Can you discover the truth and save the love of your life? Song Of Memories combines all the best parts of visual novels with rhythm-action and light role-playing systems to offer surprises at every turn. Your decisions affect what happens! Keep track of every single twist and turn with the storyline tracker, which lets you revisit choices and explore different outcomes. Discover an incredible, original soundtrack that fills more than four audio CDs, and harness those tunes yourself in an intense rhythm-action battle system. ©Future Tech Lab Co., Ltd. Licensed by DICO Co., Ltd. to PQube Limited for America and European territories.